LBD & ONESIES - A Lifestyle Blog: Firmoo Classic Series Giveaway! Who's up for another Firmoo giveaway? :) I am pretty sure you've all heard of Firmoo.com. After all, it will be the third time they'll sponsor a giveaway on my blog. Anyway, Firmoo.com is the world's most popular online eyeglasses store. Not only they are the most popular store online but they also have the most affordable prices! Prices start at 8 dollars- 80%-90% lower compared to that in local store. You'll surely love their budget friendly yet sturdy and fashionable prescription and non prescription glasses. 6 $20 E-vouchers each used on any frame at Classic Series (http://www.firmoo.com/classic-series.html) if the giveaway obtains -50 contestants. 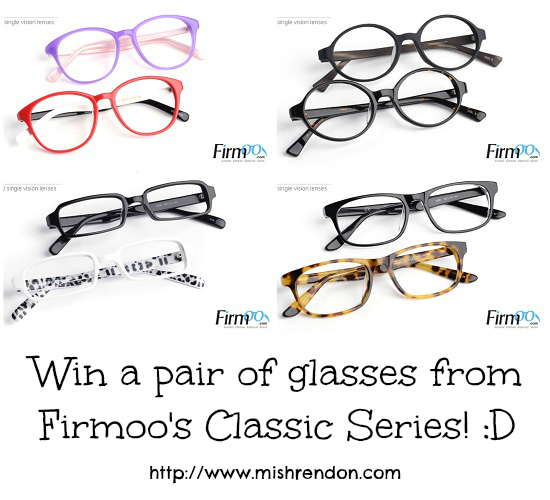 If this giveaway gets 50+ contestants, there'll be one grand prize winner who can get a totally free a pair of choice at Classic Series (http://www.firmoo.com/classic-series.html), shipping included! The giveaway will run from June 29 to July 13. Aside from joining this giveaway, you may also get their glasses for free from Firmoo's First Pair Free Program where new customers can test their products and service for free by paying shipping only. I'd love to win this pair. Would love to have http://www.firmoo.com/eyeglasses-p-2135.html#3111 as my new sunnies! Thanks for the chance! I love the #CP6080 in Matte Black. Done all. I cross my fingers. Thanks for the giveaway.